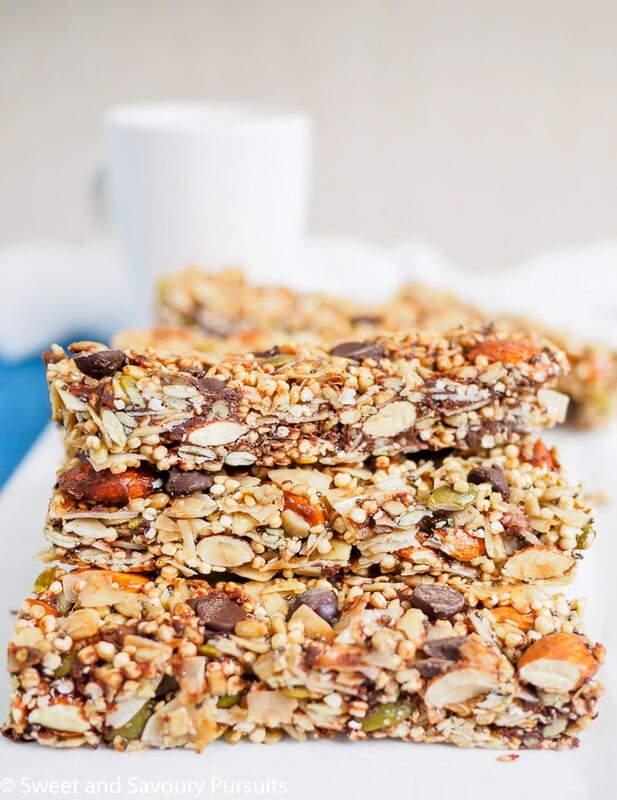 Healthy Homemade Coconut and Seed Bars made with nutritious ingredients make a delicious energizing snack or breakfast on the go. These lightly sweetened Homemade Coconut and Seed Bars are a chewy, wholesome and filling snack. Not only are they incredibly delicious, but they are made with ingredients loaded with nutrients that are good for you. What I love about this bar recipe is that it is adaptable to suit your taste or dietary restrictions. You can make these entirely nut free if allergies are a concern in your home, just be sure to add more seeds, coconut or dried fruit. These Coconut and Seed Bars don’t require any baking, though I did toast the seeds and coconut before combining the dry with the wet ingredients. This step is entirely optional and you can skip the toasting if you are in a hurry or if you prefer to use raw nuts and seeds. I also used a mixed seed butter but feel free to use any natural nut or seed butter that you like. To sweeten and help bind the bars, I used a combination of brown rice syrup and maple syrup. Brown rice syrup is amazing for binding the ingredients together, no other sweetener I’ve tried binds ingredients as well. I also feel it helps the bars stay chewy. You can read up on the benefits of using brown rice syrup in granola bars here. You could use brown rice syrup on its own to sweeten the bars, but I really like the taste of maple syrup, so I used a bit of both. 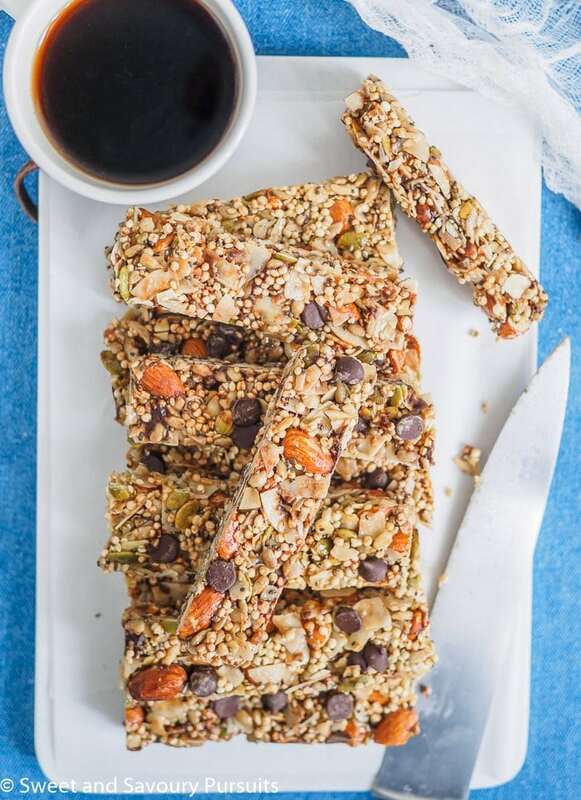 Another great reason for making these Coconut and Seed Bars is that they are great for an energy boost before a workout or for fueling you when you’re on the go. Enjoy! *Toast coconut, seeds and almonds for 10 minutes, stirring once halfway through. Remove from the oven and let cool. Line a 9-inch square baking pan with parchment paper, leaving an overhang so you can easily lift the bars out. In a medium sized bowl, combine all the dry ingredients. Mix well. In a small saucepan over low heat, combine the seed butter, coconut oil, brown rice and maple syrup. Stir until coconut oil has dissolved and mixture is syrupy. Add the vanilla and almond extract to the wet mixture and pour over the dry ingredients, combine ingredients really well and press mixture into the baking dish. Refrigerate for about an hour before cutting into bars. Wrap bars individually in plastic wrap and store in the refrigerator or freezer if you plan on storing them for longer. *Toasting the coconut, almonds and seeds is optional, you could make this without toasting them. These coconut bars look healthy and delicious! Thank you Myrna, I’m sure you would love them! MMMM – I love bars with so many seeds! The combination of flavors you have here is wonderful! Thanks Annie, I can’t get enough of these bars!